Can Dogs Eat Pears? How about the cyanide in the seeds? Pears are safe for dogs, but only when given in moderation. Pears make tasty and juicy treats. They are also rich in vitamins K and C, as well as copper. Pears also have strong antioxidant effects that can help reduce age-related issues and cancer risks. It is also a good source of dietary fiber which helps promote digestive function. How much pear is enough for a dog? To prevent an upset stomach, limit your dog’s intake to one slice of pear every now and then. As with other treats, pears should not exceed 10% of your pet’s daily food intake. 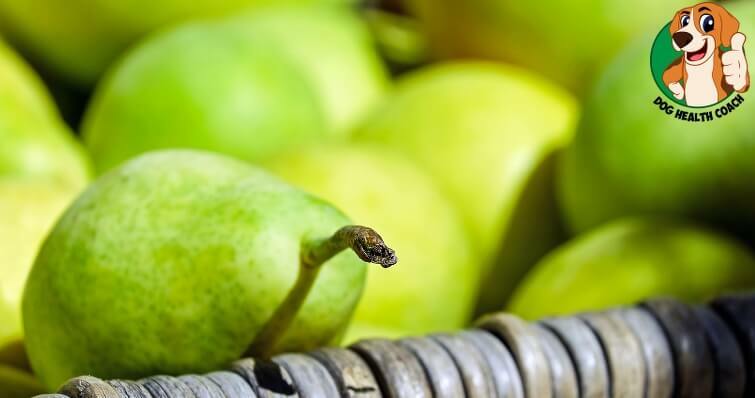 Potential risks of feeding pear to dogs! Pears are safe for dogs but a big slice can be a choking hazard. Make sure to bite-size the fruit and keep a close eye on your dog. One issue about pears is that their seeds contain traces of cyanide; however, your dog has to chew and ingest many seeds for an adverse reaction to occur. Pears are safe for puppies as long as they’re given as an occasional treat and in minimal amounts. But make sure to remove all seeds before offering slices of fruit to your pet. Traces of cyanide in the seeds are toxic to dogs. Puppies have specific dietary needs, and they won’t benefit as much if treats exceed more than10% of their daily calorie intake. What about canned pears and dogs? Canned pears are a no-no because they have too much sugar in them, which can cause digestive upsets and increase your dog’s risk to obesity. Your best bet is still offering fresh, ripe pears to your dog. Before slicing the pear into bite-sized pieces, wash it thoroughly to remove any chemical or pesticide residues. Next, remove the seeds, pits, or stem. Aside from traces of cyanide in the seeds, same with dogs and apples, if your dog swallows the pit, it may get stuck somewhere in the digestive passage and may require expensive surgery to be removed. The pit can also be a potential hazard. The skin of the pear should be left intact because it contains lots of health benefits for your dog. If you can’t eat a pear because it’s already rotten, why should you give it your canine buddy? Rotten pears can cause stomach problems. Throw them away, please!